For years, root canals have been one of the most dreaded dental procedures. Patients have often put off having this necessary treatment simply because of their fear that this procedure induces. However, root canals are quite misunderstood, and Gold Hill Dentistry wants to help clear up the misunderstanding. The first thing to understand is that root canals are not painful – infected teeth are painful. Root canals are designed to relieve pain, not be the cause of pain. The innermost layer of the tooth is known as the “pulp” of the tooth. It is in this pulp that the roots of the teeth are found. When the pulp of a tooth is infected, this is what causes the pain: the extremely sensitive roots are constantly being exposed to pain-inducing infection. Root canals are a simple and painless procedure that removes the infection and pain from the inside of the tooth. Root canals are an in-office procedure that truly causes no more discomfort than having a routine filling. Modern endodontic treatment has made this procedure extremely safe and effective and will save the natural tooth. Saving the natural tooth by removing infection is the ultimate goal of a root canal. Once a tooth is lost, it opens the mouth to a whole host of other issues, including the need to replace the missing tooth in order to protect the entire mouth. Infection inside a tooth occurs for a variety of reasons: repeated dental procedures on a single tooth, faulty crown, crack in the tooth enamel that allows bacteria to reach inside the pulp, and trauma to a tooth. If the infection is left untreated, not only will you experience intense pain, but it can lead to unbearable pain in the form of an abscess. 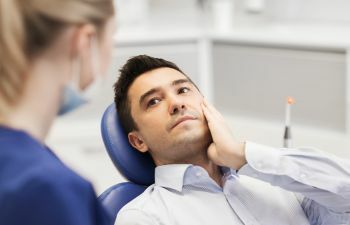 During a root canal treatment procedure, the infected pulp of the tooth is removed, the inside of the tooth is cleaned and disinfected, and the tooth is then filled and sealed. Once this is done, a crown or filling will be placed on the top surface of the tooth to prevent future damage, as well as allowing the tooth to function like any other tooth. Root canals allow patients to maintain their natural teeth. Remember, a root canal is not painful, awful, or something that you should fear. Root canals relieve your pain! Contact Gold Hill Dentistry today.